During a Roots of Empathy Family Visit to The Carleton Village Public School in Toronto, these 8 and 9 year-olds observe Baby Stephana's problem solving skills, reading her cues to understand when her interest turns into frustration. Neuroscience and social-emotional understanding are a part of this experiential learning. 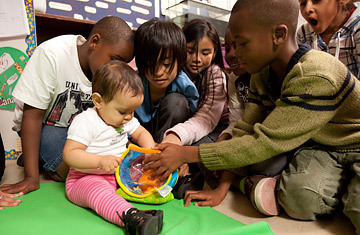 At a public school in Toronto, 25 third- and fourth-graders circle a green blanket and focus intently on a 10-month-old baby with serious brown eyes. Baby Stephana, as they call her, crawls toward the center of the blanket, then turns to glance at her mother. "When she looks back to her mom, we know she's checking in to see if everything's cool," explains one boy, who is learning how to understand and respond to the emotions of the baby  and to those of his classmates  in a program called Roots of Empathy (ROE). After the recent bullying-related suicide of a 15-year-old in Massachusetts, parents and educators around North America are wondering: Could her death have been prevented? What can schools do to stop the taunting that takes place on and off campus? And most important, can positive qualities like empathy and kindness be taught? In December, the Campbell Collaboration, an international research network, published an examination of decades of data from the bewildering array of school antibullying programs (with names like Expect Respect, Youth Matters and S.S.GRIN) and found that the ones that work best have many different elements  including engaging and training parents  and last the longest, sometimes for years. One of the most promising antibullying programs, ROE (along with its sister program, Seeds of Empathy) starts as early as preschool and brings a loving parent and a baby to classrooms to help children learn to understand the perspective of others. The nonprofit program is based in part on social neuroscience, a field that has exploded in the past 10 years, with hundreds of new findings on how our brains are built to care, compete and cooperate. Once a month, students watch the same mom and baby interact on the blanket. Special ROE instructors also hold related classes and discussions before and after these visits throughout the course of the school year. "We love when we get a colicky baby," says founder Mary Gordon. Then the mother will usually tell the class how frustrating and annoying it is when she can't figure out what to do to get the baby to stop crying. That gives children insight into the parent's perspective  and into how children's behavior can affect adults, often something they have never thought about. When Baby Stephana cries, an ROE instructor helps students consider what might be bothering her. They are taught that a crying baby isn't a bad baby but a baby with a problem. By trying to figure out how to help, they learn to see the world through the infant's eyes and understand what it is like to have needs but no ability to express them clearly. Founded in 1996 in Canada, ROE has taught 315,000 children in four countries. It reached 50,000 children in some 2,000 classrooms this academic year. To date, nine independent studies have shown that ROE schools experience "reduced aggression" and "increased prosocial behavior" among students. (ROE's use of these terms is probably the reason it was not evaluated in the Campbell study, which used a keyword search for studies on "bullying.") In the U.S., where momentum is starting to build for a congressional bill that would create federal grants for social and emotional learning in elementary and secondary schools, ROE is currently used in 40 schools, and Seeds of Empathy is in three Head Start centers in Seattle, with expansion planned next year. See more about the link between bullying and suicide.